The 5 by Peugeot concept previews the upcoming 508 sedan. Peugeot will debut a near-production-ready version of its upcoming 508 sedan at the Geneva auto show next month. The so-called “5 by Peugeot” concept previews the French automaker's new flagship, which will replace the 407 mid-sized model line and 607 large car beginning in 2011. The new Peugeot's dimensions, proportions and styling are the French automaker's response to changing trends in Europe's mid-sized segment, which is dominated by sleek, technically advanced models such as the Volkswagen Passat, Ford Mondeo and Opel/Vauxhall Insignia, which was the 2009 European Car of the Year. The Peugeot concept features the French automaker's HYbrid4 technology, which in this case matches a front-mounted 165-hp 2.0-liter diesel with a rear-mounted electric motor that provides an additional 38 hp. Peugeot says the car uses 3.8 liters of fuel per 100km (62 U.S. mpg) and emits 99 grams per kilometer of CO2 – or zero emissions when driving in full-electric mode. Peugeot's Hybrid4 technology will be launched first in 2011 in the Peugeot 3008 compact crossover. Peugeot says it put its hybrid solution in the larger, more advanced concept car to show that the modular system can be added to models of different shapes and that are built on different platforms. The 4860mm-long, 1880mm-wide 5 by Peugeot will share the stand in Geneva with the similarly styled SR1. The sports car and sedan concepts highlight the French automaker's new design language, which features front-ends that are less aggressive than the “big cat” look of current Peugeots. A key design difference is that the concepts have much smaller grilles than those found on existing models. 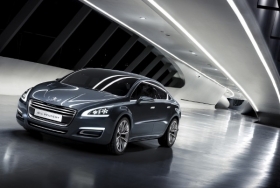 The 5 by Peugeot's face is further enhanced by its long aluminum hood and LED headlights.